duration. 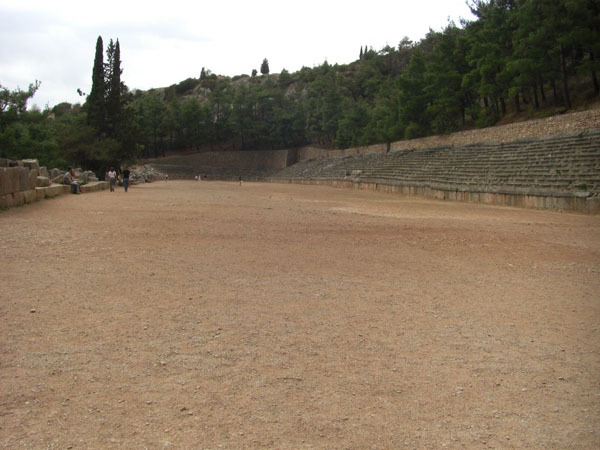 The musical games performed at the theatre, while the athletics in the stadium and the horse races at the hippodrome which was somewhere in the Crissaean field. For the Pythia ceremonies, as other Pan-Hellenic games (Olympia, Nemea, Isthmia), were imposed in all the Greek region a three-month truce, element that played important role in the political life of ancient Greece. Reward for the victor was a wreath from the holy plant of Apollo, the laurel, but the honour was big and eternal. Outside the sanctuary and at the highest point of the slope around the Phaedriades builted the stadium for sporting events at Pythia games. It was founded at 5th cent b.c. but its current form was taken at 2nd cent B.C. where with money of Herodus Atticus the stone wedges and the 3 arches at the entrance were constructed. On the northen 12 rows of seats and on the 6 southern were seated 7.000 about spectators. The length of track was 1 stadion(stage) ie 180 about metres, as long as it was the length of the foot race - road speed is. The name of the principal sporting establishment , the "stadion", comes precisely from the length of speed road in the ancient athletic games.